The Hotel Grand Chancellor Hotel is popular with visitors to Auckland. Its central location within the CBD, as well as its waterside views, make it a great choice for those who want to explore the city. 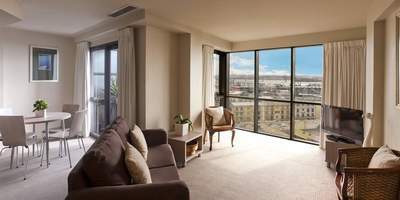 The rooms at the Hotel Grand Chancellor Hotel are clean and functional with a muted colour scheme and a choice of sizes and views, from the Downtown Studio rooms to the more homely One-Bedroom Apartment with Harbour Views. There are many complimentary amenities available, including Wi-Fi, balcony areas, air conditioning and cable channels. Each room also features a fully-stocked minibar with wine and spirits and wake-up calls are available from the front desk. 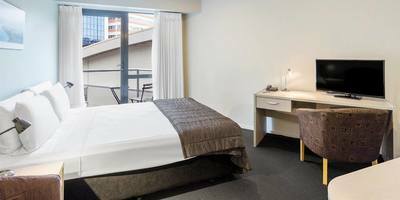 The Hotel Grand Chancellor Auckland City offers a continental breakfast buffet and there are many restaurants and eateries in the busy Viaduct precinct nearby. If you prefer to eat alone, there are kitchenettes available in each suite and apartment. There are also a number of gym facilities available on-site, including treadmills, exercise bikes, weights, and more, alongside a swimming pool, spa pools and a relaxing sauna.